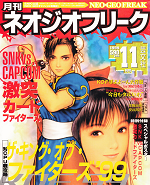 The 1999 Vol.11 issue includes a 40 page article about KOF '99 and other features on SNK vs. Capcom: Card Fighters Clash for Neo Geo Pocket Color and also Koudelka. 148 pages. This is a comic book archive file (.cbz). You can use one of the comic book viewer programs linked to below to view the file. Note if you are a Linux user most PDF viewers e.g. Okular, Evince will also be suitable for viewing the file.